In the summer of 1939 the British heroine had taken a job for a regular wage as a ferry pilot, flying passengers daily between Portsmouth, Southampton and the Isle of Wight. Nine years earlier in 1930, as an unknown novice pilot with a dream, Amy Johnson shot to world fame. She risked her life in an audacious and dangerous solo flight, from England to Australia, in a tiny bi-plane. She became the first woman to complete the journey. So did she consider her 1939 role with a small south coast airline as a ‘come down’? No, the exact opposite was the case. She declared her love for her new life flying over and sailing on the Solent. Follow this link to read about her association with the area and Amy Johnson’s newfound happiness working in Portsmouth. 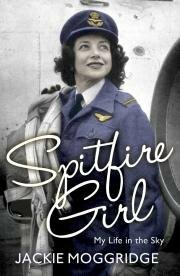 The ATA Museum (Maidenhead Heritage Centre) is planning a book launch event for ‘Spitfire Girl’ at the West London Aero Club on 19 July 2014, subject to final confirmation. Jackie’s daughter Candy is hoping to attend the event. 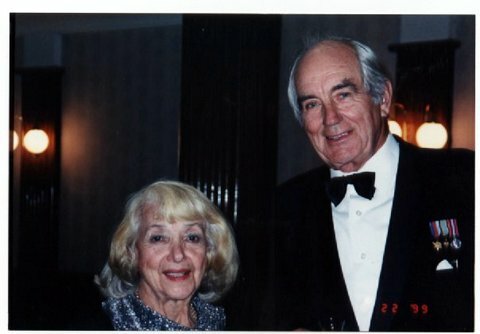 ATA First Officer Peter Garrod, now Commodore of the ATA Association, has kindly sent in this photograph of himself with Jackie, at an ATA Reunion Dinner. Jackie Moggridge with ATA Association Commodore Peter Garrod.